Some people consider an exact-match domain (EMD) a thing of the past. Others think EMDs are still going strong. As for me, I always look at the data to the find the answers. In this comprehensive resource on EMDs, I show you that data and reveal everything you need to know about exact-match domain names. What is an exact-match domain? How much do exact-match domains cost? An exact-match domain is a domain name that exactly matches the searched keyword phrase of a user, and contains no dashes. For example, if you search Google for the keyword phrase “diapers,” then Diapers.com would be the exact-match domain name. And EMD is either a single word like Insurance.com, a phrase like ReputationRepair.com, or a geographic location like LasVegas.com. Reputation-Repair.com and Las-Vegas.com would not be considered EMDs. If the domain is a real word but one that few people are searching for and few advertisers are interested in buying search advertising against, it is merely a generic domain name. Some examples of generic domain names are Piled.com, Gripped.com or Smoothest.com. The top level domain (e.g., .com, .net, .org) doesn’t matter in determining if a domain name is an exact-match domain, although it does play a role in the value of the domain name and the user’s perception of the website. The most pristine example of an exact-match domain name is a single generic word that defines a product, service or industry, but exact-match domain names extend to multiple words – often called long-tail search phrases. Thousands of examples exist for both single and multiple words, and they are owned by small and large companies alike. Interesting side note: While Amazon.com may seem like an exact-match domain, it is merely a generic word domain name. The word “amazon” does not match any of the products or services it sells except maybe books about the Amazon rain forest or river. However, “amazon” does a great job describing the quantity of products and services it sells. 1. EMDs are in limited supply, so they’re worth more. All exact-match domain names have been registered, and anything in limited supply always carries a premium in valuation. To own an exact-match domain name in the .com top level domain takes either the foresight to have acquired it over a decade ago, extreme luck in acquiring it from the registrant who doesn’t understand the full value of the asset, or deep pockets to buy it from the registered owner. Take CordBlood.com, for example. You would need to have registered CordBlood.com prior to June 6, 1996, or purchase it from the current owner today for high six- or seven-figures (if they would even sell it). Two exact-match domains related to cord blood you can purchase today are CordBlood.us for $2,600 on Sedo, or CordBlood.fr for a hand-registration fee, but neither are as good as a .com top level domain, which is recognized worldwide by consumers. In contrast to exact-match domains, brandable domain names like BestCordBlood.com, FreshCordBlood.com or MyCordBlood.com are much easier and less expensive to acquire. However, you are likely to lose traffic to the exact-match domain name by users who cannot remember your brand. Consider these two instances where established companies paid to acquire a brandable domain name that was easier to spell or simpler to remember than their original brand. The online service marketplace Fiverr.com purchased the domain Fiver.com (one “r”) for $70,000 in April 2011. They found users did not remember the double “r” in their brand name and were instead visiting a parked website. 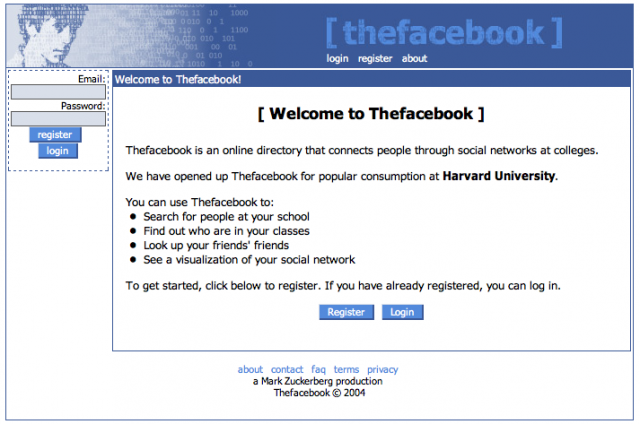 Similarly, social networking website TheFacebook.com upgraded to Facebook.com in 2005 for a reported $200,000. Having a brand that is memorable to customers is important for any company, but particularly for one in which customers must type that name into a web browser in order to visit the business. 2. EMDs receive type-in traffic. Type-in traffic, also called direct navigation traffic, happens when a person types a keyword or phrase (without spaces) into the address bar of their web browser and appends a .com (or other top level domain, such as .org or .dk). This is in contrast to users who arrive at a website through search engine results or other referral links. For example, a customer who knows they want to buy an ebook for their Kindle ereader might type “Amazon.com” directly into their web browser. The more interesting instance of type-in traffic is when someone who is looking for, say, bicycles, simply types “Bicycles.com” into their browser not knowing if a website exists, but just hoping to find something useful. It happens more than you might think. Although there are no citable reports of how much type-in traffic various domain names receive, confidential industry sources peg type-in traffic at anywhere from tens to tens of thousands of unique visitors per month, depending on the word. Insurance.com is estimated to receive 2,500 type-in visitors per day (see Estibot.com tutorial to learn how to find this information). PalmSprings.com receives 25 percent to 30 percent of their traffic through direct navigation. Even a very niche exact-match domain name like SEOBlog.com, which was undeveloped and parked prior to launch in May 2013, received 65 visitors in January 2013 – more than two visitors per day on average. And the traffic increased to 95 in February and 92 in March (data supplied from Web X.0 Media, and gathered via DomainNameSales.com parking platform). Type-in traffic varies based on the number of words in the EMD (e.g., single-word domains will generally receive more type-in traffic than three-word domains) and the search popularity of the keyword or phrase. In other words, shorter domains with a name that reflects a highly searched keyword receive more type-in traffic. 3. EMDs Have Immediate Brand Recognition and Authority. This is probably the most important benefit of an exact-match domain name. Imagine you are wanting to send flowers to your mother for Mother’s Day and you search on the keyword “flowers.” You are more likely going to click on a website called “Flowers.com” than “PattysFloralShop.com.” That instinctual preference you have for the exact-match domain name reflects the authoritative power an EMD enjoys. When Michael Castello of PalmSprings.com calls on customers, they immediately know what he represents and likely knows what he is calling about – or at least they want to pickup the phone and have a conversation with Michael because he controls one of the most valuable tourism assets in the community. That’s the power of an exact-match domain name, which Michael Castello, Marty Metro and Jesse Stein all attest to in their DomainSherpa interviews. Michael Castello, PalmSprings.com: Our success is based on the trust factor people place in our domain. Michael Cyger: In your opinion, is the domain name one of the most critical foundations to build a business on? Michael Castello: Well for us it is. And I believe it should be for anyone that has a global approach in their business. And again even a local approach in your business. That one name could define a lot of future revenue and also cut down your competitive state later on. For us it is always – let’s say daycare.com, people who actually come and scrape our database. Now our database is at people who actually came in and signed up since back in ’97. They will come and they will scrape the information off. In the long run – when you think about it – they can’t get the brand and the brand is what brings in the traffic every day, new traffic every day. So for us that name is premium. When you think about, when you were talking about PalmSprings.com – the kind of revenue that it does make – you know day after day, week after week, year after year that revenue comes in. And I truly believe it is because the trust factor that people place in a name. I mean if you are going to go to Ford – Ford.com, Mattel – Mattel.com, Palm Springs – PalmSprings.com, Nashville – Nashville.com, it just has that trustability. And when you go to a grocery store and you see the shelves are piled with 25, 30, 50 different cereals brands and more than likely I mean you are going to look at a brand you have seen on TV, something you trust. And in a lot of ways that is really what we get inherently in those domain names – is that trust factor. Now what is that worth especially on a global scale? That is worth so much. It all starts and ends with us with the domain name. Hopefully it is a name that it is something that you have a passion in. Something that you would enjoy doing every day and I would really believe it all revolves around the premium domain name…The category killer name. Marty Metro, UsedCardboardBoxes.com: For a business to succeed, they need every advantage they can get. Marty Metro: If you were moving and you saw the domain name that said UsedCardboardBoxes.com and you knew you were moving, it is worth checking out. And we learned that powerful, powerful lesson that companies like Amazon and companies like Michael Dell…it is his last name, Dell. He probably was not being very creative. He was just like whatever; I just need a name to put on this form. And they were brilliant people, very lucky also in their timing, and they were brilliant enough to work that luck and time it right and build on it. Most people aren’t. So you really need every advantage you can possibly get. And for us, I did not care about making a cool name like Zazzu or whatever that I had to then go out and, every time I wrote that name, I had to explain it. UsedCardboardBoxes.com – didn’t have to explain it. Jesse Stein, SportsMemorabilia.com: EMDs open up doors to suppliers, partners, investors and customers. Michael Cyger: Could you have bought SportsMem.com, so it is not even SportsMemorabilia[.com]? How much more difficult do you think it would have been to build it off of a brandable domain name versus a generic keyword domain name? Jesse Stein: Right, that is a great question. And I think it is in the eye of the beholder. So, there is a lot of beautiful brands out there. Obviously, with Zappos and Amazon, and Ebay, and the like that are not generic names. But I always believed in the power of a generic name, especially when you are self-funded and smaller, and you are trying to open-up doors to suppliers and partners and, later on, investors and customers. And I think that there is tremendous value that is conferred by a category-killing domain name that really has no real synonym. I think that is the key; is you cannot buy a name where then there could be twenty other words that would be similar to that name. With sports memorabilia, there is really nothing that completely defines the industry; and it happens to be a really important facet of our model because sports memorabilia is all about authenticity, and we live and die by authenticity, and just our name alone confers that authority. And so, I think, in this specific case, it was huge, just owning the name. And once you own the name, no one else case. So that is what is beautiful about it. Exact-match domain names can cost as little as four figures (i.e., $1,000 to $9,999) and as much as eight figures (e.g., $10,000,000). The highest known sales price of a domain name without an operating business included in the sale, Insure.com, is $16 million. Jesse Stein of SportsMemorabilia.com paid $12,500 for his domain name back in 2006. Most exact-match domain names run in the five figures, from $10,000 to $99,999. Yes, this is a big range, but keywords and phrases vary greatly in search frequency and advertising competition, which accounts for the large range in value. Most domain name brokers will tell you that an exact-match domain is worth what a buyer and seller will agree to. While that can be the case, an agreed-upon sales price doesn’t always reflect the true value of a domain name. Sometimes you just get a good deal. Consider the process of selling a home. I may think that my house is worth $350,000, but to determine a reasonable listing price, as well as to decide upon any offers received, I need to compare my home to the three or more similar homes that have recently sold. Unlike in physical real estate, however, in Internet real estate, it is not easy to find comparison data points of exact-match domain name sales. In lieu of sales comparisons, I recommend getting as many valuation opinions as you can when buying or selling an exact-match domain name. Additional benefits for owning an exact-match domain include defensive domain purchasing (i.e., preventing competitors from owning it) and increasing asset value. The top three reasons discussed in the previous section – limited supply, type-in traffic, and brand recognition and authority – are compelling enough for most EMD registrants. A fourth potential benefit is better positioning in search results. All things being equal, an exact-match domain can help your website rank higher. Assuming two websites both have equally great content, beautiful design, strong marketing and social media tactics, regular publishing schedules, strict editorial standards and similar budgets, the website that has the exact-match domain will likely win over a non-keyword domain name for the desired keyword or phrase. Michael Cyger: I did some research prior to our show. I went on Google and I searched “cord blood” which – you may be aware of – it’s an enormously high cost per click on Google. And what I found is, the #1 organic result on Google is cordblood.com. The exact-match. I went and searched for “car insurance quote.” The #1 result is carinsurancequote.net. I went and searched for “immigration lawyer.” The #1 search result is immigrationlawyersnow.org. I didn’t see immigrationlawyers.com but maybe because that website’s in Spanish and Google knows that I only speak English and eat yogurt for breakfast and have a dentist’s appointment after this interview and everything else that Google knows about me. It seems to me that good businesses coupled with great generic keyword domain names gets a website to the top of the listings. Is my logic sound or flawed? Is it happenstance? Danny Sullivan: It can help. I’m assuming that the sites that you went to were all substantial in some way…that there was substantial content. Michael: They are, from what I can see. It makes sense that a great website with a great exact-match domain name should rank higher in search results – and that search engines algorithms should be designed to rank those sites higher. In most cases, an exact-match domain name will answer the question that a user is asking through their search. EMDs speak directly to user intent. For example, when a person is searching Bing.com for “insurance,” they are most likely looking for insurance information for, say, their home or car. Finding the website Insurance.com, which provides the very information a user is looking for, at the top of the search results is a useful response to the user’s query and thus should be the objective of search engine algorithms. Andrew Rosener, MediaOptions.com: EMDs unquestionably have an advantage because it shows user intent. Michael Cyger: Let’s talk about Google and exact-match domains. There has been a lot of hype around Google changing their algorithm to give less of a benefit to exact-match domains like SearchEngine.com, when people are going to a search engine and typing ‘Search Engine’. Andrew Rosener: Come on, you can think of a better example. Michael: Baby strollers. You want to find out reviews of baby strollers…you are buying some stuff. Which baby strollers are the best? You type in ‘baby strollers’ and then BabyStrollers.com shows up on top, even though it may not be the “best” – from your determination – content site for learning about baby strollers. So Google says, “We are going to not give as much benefit.” Some people called it a penalty – whatever it is. What is your take on the exact-match domains? Andrew: So, I think that update to Google’s algorithm has been grossly overestimated and misunderstood. Essentially, what they’ve done – and I do not claim to be the expert on search engine optimization in any way – but I deal a lot with some of the top SEO companies, and it is my understanding that what has been done is that whereas if you owned BabyStrollers.com and you had a one-page website on there with some brief content before, you could still – not in some of the most competitive verticals but in, let’s say, second tier and third tier verticals – you could probably rank on page one for that term if you had the exact-match .COM, .NET, or .ORG domain name. What Google has done now is they have said, “Okay, look, we are going to evaluate all the exact-match keyword domains for the high competition keywords and we are going to compare them to the other results in that category. And if the content is apples to apples, then the exact-match keyword domain name is still going to have some advantage.” Maybe not as big of an advantage as it did previously, but there is unquestionably still an advantage given to exact-match keyword domain names in the search results in Google. But the content – the user experience – needs to be apples to apples in quality with the other websites that are displayed in the ranks. Michael: Right. So, why is that fair for Google to do that; to say if the sites are the same content, the same functionality, the same user benefit – why would they give a little benefit to BabyStrollers.com versus AndrewsBabies.com? Andrew: Well, because I think – at the end of the day – an exact-match domain name shows intent. So, it tells the user what is this about. And if I am BabyStrollers.com, I am probably selling baby strollers. And that might be what you are looking for, mostly likely, if you are searching for baby strollers. Andrew: So I think it immediately shows intent, which enhances the user experience. It speeds up the user’s search and gets them faster to what they are looking for. As with anything, when people notice something good occurring they try to get more of it, many times “gaming the system.” In the case of search engine results, Internet marketers began using exact-match domain names to rank websites with marginal content higher in the results. When people noticed websites with exact-match domain names were ranking higher in search engine results, they purchased more EMDs and the problem grew. Thin-content websites with exact-match domains were ranking high in search results. High-value websites without EMDs were being outranked by lesser-value websites with EMDs. So the company decided to do something about it. Matt Cutts, SEO guru at Google, even commented publicly at a PubCon conference that the search engine giant was investigating the matter. He later made a formal announcement on Twitter. Google rolled out their EMD update on September 27, 2012. 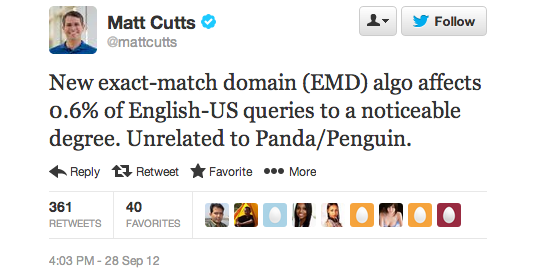 The purpose of Google’s EMD algorithm update was not to devalue exact-match domains. The purpose was to devalue thin-content websites that used exact-match domains to rank well. Only 0.6 percent of all search queries were affected. While the graph above looks like EMD correlation value is “dropping” off the chart because of the scale, it is only a decrease from 3.58 percent to 3.21 percent. 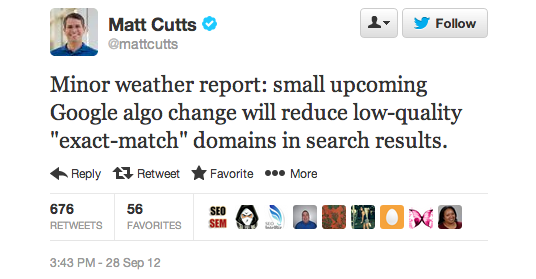 Exact-match domains still correlate to higher search rankings. For example, a search on the keyword phrase “Google keyword tool” will yield Google’s official page on the topic in the first position, but a thin-content website with an exact-match domain name (not affiliated with Google) still comes up second out of over 35 million results. The change in Google’s algorithm was not welcomed by everyone. Those owners of exact-match domain names who were trying to extract free traffic from Google for their “built for AdSense” website by ranking well as a result of their EMD were upset because their revenue dropped significantly when their rankings, and subsequent traffic, dropped. Chad Fisher, WordsForLess.com: Google will make ranking difficult if you publish thin-content websites. Chad Fisher: I will say that, in the overall, as I said, that business has changed quite a bit, and we will get into that a bit with some of the latest updates. So, I do not do that nearly as much as I used to just because Google has done a great job of kind of bifurcating the world into affiliates and real companies. Everything from Panda to Penguin to EMD update – they have segregated the population of, are you just informational-only sites – getting in the eHow, your example from earlier – or only a lead generation site. Are you trying to extract organic traffic from us? And if you are, we are going to make life harder for you, because being a thin affiliate is very difficult where, three or four years ago, you could throw up almost any site and if it had an EMD on it, you could rank, you would get great traffic. It was very easy. Those days are not over one hundred percent, but they are a lot more difficult now. Exact-match domains will continue to be in high demand by business owners and website publishers because users implicitly trust them like brands, they receive type-in traffic, they rank more easily in search engine results, and the supply is limited. But exact-match domains aren’t right for every company or every use. Amazon.com – which started as a book retailer and now sells virtually any product you can think of – would have made a terrible mistake to pigeonhole their business into a specific industry by buying a domain name like Books.com (owned by Barnes & Noble). As it turns out, however, having a brandable domain like Amazon.com doesn’t preclude the company from also competing in a single industry with an exact-match domain. I became friends with Jesse Stein’s father Jerry and he explained to me the value of an EMD. Soon after watching your interview with Jesse, I decided to experiment with an EMD to learn some lessons before deep diving another EMD, and so I launched organicsodapops.com. Because I was new to this industry and I knew nothing about web development or SEO, I felt the organic soft drink market would be a good place to get my feet wet. I followed the steps and advice in your interview with Jesse and within a few months, I was ranking at the top of page 1 on google for at least 95% of the keywords for the organic and natural soft drink market. I am now working on my 3rd site and soon I will begin to develop musicmemorabilia.com since I purchased it. Congratulations on such excellent content. Thank you for sharing with us. Exact or even phrase match in domain names DO help somewhat in getting ranked but not because they hold any algorithmic SEO advantage. Fishkin is right; when you get natural links that simply use your domain name, the anchor text of the links has the keyword phrase in it. That does help a little and there are no penalties when it is your domain name (with Penguin 4.0 there are no algorithmic backlink penalties anymore, anyway). You need far more going for you than an exact match domain link, though. 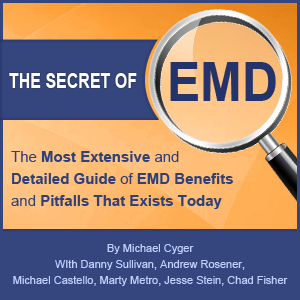 Good extended info on the subject of EMD’s, was great to read and insightful. Even 4 and in some cases 5 word exact match domains are proving to be valuable, if not for the main site but for an additional marketing tool. @kevin-i wouldn’t mind looking at that fine print if you you could send me a link to their tos? geodomains do well. I think even perhaps more so in Yahoo bing algorithm you get more pat on the head or rewarded. I really appreciate that you’ve taken the time to write such a thorough piece on such an important topic. My experience with EMD’s has been thoroughly positive. I represent prisoners before the Texas Board of Pardons and Paroles. My previous domain name was ParoleFreedom.com, and I thought it was pretty cool, but I never got past the bottom of page 1, and some terms had me on page 2, 3, or 4. In 2013, When I got in a billing fight with a huge national company that rips off lawyers (claiming to be lawyer SEO experts), I had to get a new domain and build a new site from scratch due to the fine print in their contract. I had a choice; pay their ridiculous charges (that got me horrible results) or start over. I was really bummed. I bought TexasParoleAttorney.com for about $1,400, and built a homemade site on GoDaddy. Within 6 months, I was at the top of the organic results for all of the important keywords. Take a guess what the highest search phrase is for people who are looking for a parole attorney in Texas? I agree that content is the key, as it should be, but I also have no doubt that my domain name has gotten me a lot further, a lot faster, with a lot less cost and work involved. Thank you for a very informative article. I was recently hit with the EMD for my website, now I have almost no traffic from Google, only Bing/Yahoo. Most of the domains you listed are still searchable and found on Google if you search the main domain name. Search “officesupply.com” for instance and that .com comes up in the 1st page results, top of page. But for the general population of Internet webmaster without the deep pockets of Amazon, Office Depot, Dell, etc. our domain name gets penalized off the search completely. If you search for my domain name ‘vaporcigarettes.com’ in Google it does not exist…removed for EMD. This website was established in 2009 and always had decent rank in the top 20 results. Now according to Google it is worthless because the domain name contains terms that have recently become a very highly searched term. This unfair manual manipulation of the marketplace is certainly crossing the line. It is fair to calculate website position based on set computer algorithms, as that is without bias or politics. However Google has undermined the net equality with human ‘manual actions’ which cannot be done without personal bias, political or even financial interests. With manual actions Google employees can sway markets, demote political websites of parties it does not agree with, or boost the sales of companies by manual actions. We read about similar complaints all over the net. Thousands of webmasters now with substantial losses over Google’s manual actions. While I agree that some sites are plain garbage, the use of manual actions is still a biased discriminatory mark against a person/business. In perspective if the Mayor of your city didn’t like your storefront and put boards over your windows, you would have a case in court. Webmasters complaining is not going to do much of anything, but if we group together we could file a class-action lawsuit against Google. Just something to think about…. Such a good editorial piece. Well done, Michael. I think emds should rank higher only if they provide a similar or greater value than its organic search competitors. They do show a great sign of authority and I can see why some of the emd owners are upset about it. They fork out a lot of money for one word emds. Very well done article. I don’t often leave comments, but this is probably the best well put together, researched, and cited article that I’ve ever seen. Great job! I think getting new EMDs up the SERPs is there is no particular benefit now, but obviously historics EMDs have developed an authority in their own right, so have only been slightly amged by the various algo changes. In our particular area the appropriate search phrase is a three word locational phrase, and not a single on on page 1 organic (including us) have a domain name any where near the search phrase, but all but 2 contain title tags that contain the phrase. Great article, loaded with tons of great information. In the end of the day Exact Match domains are still working for SEO, you just need to build a quality site with a quality link profile. I own 100+ EMD’s and most still do fine today. I do play the audio on my phone from time to time especially at night when I’ m in bed, or any time I need to study domain business. Your audio gives me confident and assurance that domain name business is real and that it is universal for every one who love to practice it without prejudice. Infact, I use your audios for relaxation theraphy when in distress and when trading forex or travelling. Infact I play your audio more than music. It would be a great pleasure if you can produce it as you said; but if it is just because of me, it may not necessary because of your time. I have tried to get it today but the page is not available for downloading. This resource was different than our usual interview. Usually I do the video interview, create the audio, and then upload the audio to our server and iTunes. Because this was an article with separate video excerpts, there was no single audio to create or upload. Tell me, please: how do you use the audio? In an ideal world, would you like me to read the article, and then create the audio from the video excerpts and insert them into the audio? Here is some data why this domain owner is upset. http://www.theleatherbriefcase.co.uk sold tens of thousands of quality leather business cases up until last October. Since then when you search for “leather briefcase”, the main term, we’ve been demoted to obscurity in the rankings. fortunately we still get enough traffic to survive, and our loyal customers keep coming back foe more. But we feel that we’ve been penalised for being too relevant! Your job is second to none as per domainers development. Good job and thank for the immesurable contribution. Please Michael sorry to deviate a bit. How Can I add my pix on this blog instead of the blanc icon. Your picture can be associated with your email address at https://en.gravatar.com/. Just sign up with your email that you post with on blogs, such as this one, then upload a picture or graphic. Whenever you post on a site that is WordPress powered, like this one, it will display your picture. I believe it will also associate your picture with previous posts as well. And you can add more than one email address once you’ve created your Gravatar account. Yee! Thanks Mike, the gravatar is up.Cheers. I’ve heard so much about why EMDs aren’t worth what they were, this research helps show just how much of a difference there is – 0.37% – which can be safely ignored for well developed sites. It’s only the MFA sites that are affected and it’s not only due to this update, Google has been going after those sites for a while now. Exactly, Samit. Thanks for commenting and promoting it via Twitter. I appreciate it. Excellent article, Michael. Contrary to the belief of many, EMD’s are alive and well. Do a few searches on Google and you will see them all over. Not to mention, I sell a few each week. Great point, Alan. A few a week? Nice. I’ll be in contact to see if we can get you on the show to discuss! Check your email inbox. For sure these (we call them exact search terms) .coms have value for all the reasons mentioned. I like the term “implied authority” that’s exactly what they confer…..Thanks kindly for your fine effort. Thanks for taking the time to comment, Craig. I appreciate it. Great content as always Mike and very timely in my opinion, given the wave of negative speculation about the impact of Google changes on EMD’s, its of great value to have these expert views when selling to end users. I think its also worth noting, that as Bing continues to rise, the non-Google search market is now at 33%, which is a significant amount of traffic unaffected…. Thanks, Troy. Yes, Bing is on the rise and Google is not as dominant in other parts of the world. EMDs will continue to shift in value also, both lower and higher. I regard this as a byproduct of so many interviews and research you’ve processed & conducted. And, sometimes a by-product unexpectedly becomes more valuable than the main product. And, this holds true for this excellent post. My thanks to all the contributors: Michael Cyger, Danny Sulivan, Andrew Rosener, Michael Castello, Marty Metro, Jesse Stein & Chad Fisher. Agreed. Thanks for commenting and thanking these Sherpas again, Irfan. Sorry Mike, but I am going off topic a bit. Great topic idea. I’ll look for one or two to interview. Thanks for the suggestion, Albert. Great job Michael, been following your site for a while, and this is the best post by far! RFLOL!! Micheal, What is a domain name hack? Here’s where it wouldn’t have worked well. Meet.me is valued at $6,000 (http://www.estibot.com/appraise.php?a=appraise&data=meet.me) whereas Michael Berkens was able to sell it for $450,000 as a domain name hack (http://www.dnjournal.com/archive/lowdown/2011/dailyposts/20111117.htm). We also focus on the EMD market. Many who in a high competition industry as insurance tend to compete with adwords. You might not be able to get to the top or even beat out the govt sites but an EMD brings consumer confidence through the credibility in which an exact match domain hails. Having said that if your looking for health insurance in florida and google instant brings it up in suggestion and you click it – then see the emd at the top…who else are you going to click on but healthinsuranceflorida.com. There are many examples but this article is emphasizing and concise. Great point. Thanks for commenting. Nice article Michael. I own allinclusive.co.uk which used to rank #1 for ‘all inclusive holidays’ and other highly relevant and massive volume traffic searches. We offered the widest range of all inclusive holidays, had over 1000 pages of unique relevant content and were very competitive on price, but sadly we got murdered by the Penguin because we were naive when it came to selecting our SEO company and didn’t fully understand what their work involved. Interestingly, the site (which now has virtually zero content) still ranks in #1 position on bing but is not in the top 50 on google. Our plan is to simply wait (perhaps another year) before redeveloping a strategy for this domain or even to sell or lease it out. All thoughts and views are welcome! Tom, I would say that your brand anchor text distribution is what could be affecting you. Waiting may not make a difference. Get new links or swap existing ones using the url many more times as this is not in the top 10 anchor keywords for your site. It’s over optimised for all inclusive holidays! @Tom: I find that Bing lags Google by a period of time. They just don’t update their index as often. And I also have sites that are ranking well on Bing and not as well on Google. I believe Gary is correct: publish more great content and get more inbound links (which should be a natural byproduct of publishing great content). A comprehensive and thorough article on exact match domain.Well done Michael. This is highly educational and great job, Micheal! Keep it up. I now have a clear concepts of the EMD and Google feelings about their business. OK, no wonder the site motelrock.com ranks #1 when I search for “Motel Dresses” (which is EMD) and get moteldresses.com ranks on Google page2, behind many website with users intent. So does that mean if the site remains informational/educational may not rank on Google page1? Yes, Google views the content of MotelRocks.com as being more comprehensive than MotelDresses.com, which is why it’s ranking it #1 whereas MotelDresses.com (an EMD) is lower in the rankings. If you provide more useful content to readers, who in turn link to your site more often, eventually your website may rank #1. I might have missed it in your fantastic post, but do you think the EMD in .com and .net is still important in selling to client’s for URL Forwarding purposes? Thank you. I do think that companies buy the EMDs just to redirect still. Look at the Examples of Exact-Match Domains section (https://www.domainsherpa.com/exact-match-domains/comment-page-1/#examples), six of the 10 are just redirections — not developed websites. This was purely coincidence as I did not choose a certain number of each when I selected the brands…it was more of a selection of one and two-word EMDs. Excellent article Mike. I beg to differ with you that exact-domain.com would not be called exact match domain. When people search for the term in a search engine, and if even a dashed exact domain website is found. Visitor do have bias for that website as well.What you think? Well, the purest form of an exact match domain name is domain.com or domainname.com. If one of the benefits is that people will type-in the domain in an address bar, it’s hard for me to see that people would type-in dashes in the domain name. FINALLY, A great explanation of EMD for us noobs. Thanks for all your time & effort in writing this. My pleasure, SerryJW. Thanks for taking the time to comment. It seems that every article you write is a hit. It’s nice to see another home run. Way to sherp ! !, and provide some nice clarity and logic to the relative specific benefits of EMD, and some differentiation on generics and emds. then theres the special benefit that professionals, and business just want better names, the economic troubles of 08 ripped the wanting out of many businesses, but the desire to have the best, or the better still lurks.. Yes, good point Dr. Howe. I agree, companies always want better names. Thanks for being a past Sherpa, and for commenting. Good overview. It is always puzzled me whether EMD are worth buying or not. Now it is clear. Thanks for the research! Glad to hear that. Thanks for commenting. I agree with Sullivan – if you have expertise and build a valuable website on premium domain – you’ve got gold. Keep up with the good work of interviewing those who actually have physical products that sell through e-commerce. I am tired of hearing about those who have started internet companies that sell hosting, vacations, solutions, etc. The fact of the matter is that those who have actual products to sell have more of a hard time (then non-product websites) but they actually have to have the product or have access to it. I saw that Dragon’s Den episode. I watch DD and Shark Tank religiously. You may have had duplicate comments from me. The Captcha is tricky on mobile. Congratulations on the single best piece of reporting I’ve ever consumed in this space. You poured your heart, soul and many, many hours into this and it shows. Extremely impressive for a guy who probably never heard of a type-in yourself before you set out to be an expert at the outset of this venture, which you now are. Bravo! Great article Michael. I must say I think its funny how Matt Cutts called the algorithm update a “Minor Weather Report” when in reality it was probably the biggest change at Google since its inception and was recorded as a F5 on the Fujita scale. I don’t know…I’d say there were plenty of other updates (listed at http://moz.com/google-algorithm-change) that were more significant than the EMD update. I agree with Matt Cutts on that point. I guess it depends on which side of the update you were. If you had an EMD with a ton of great content, stripping away all the other EMDs would benefit you. What an exceptional article… sometimes I wish you’d just interview yourself so that we can get all our questions answered! Don’t see much mentioned in regards to ccTLD’s and was wondering how you’d value those – example someone in India looking for cameras may find cameras.in more useful than cameras.com – or is that not the case? I don’t see much regarding the value of ccTLDs either. If you think that Estibot.com is valuing hotels.com properly at $10 million (http://www.estibot.com/appraise.php?a=appraise&data=hotels.com), then what do you think about the valuation of hotels.ca at $72,000 (http://www.estibot.com/appraise.php?a=appraise&data=hotels.ca)? I think the order of magnitude is probably about right, don’t you? So I’d use Estibot.com for an order of magnitude estimate in many, but not all, cases. Here’s where it wouldn’t have worked well. Meet.me is valued at $6,000 (http://www.estibot.com/appraise.php?a=appraise&data=meet.me) whereas Michael Berkens was able to sell it for $450,000 as a domain name hack (http://www.dnjournal.com/archive/lowdown/2011/dailyposts/20111117.htm). There will always be outliers with ccTLDs. I appreciate the time and effort you put into this. Thanks, Aron. One of these days we’ll get you on the show talking about your investments in XF.com, Symbolics.com and others! That would be fun. Yes, I am aware of that research paper. It was written by Microsoft in conjunction with a researcher at Stanford University. Many blogs (like SearchEngineLand.com) referred to the original research, but — I believe — are drawing the wrong conclusion about the results. I printed and read the research report in detail. I actually had a full section on the research in this article, but later deleted it as there was no data to support the theory — not that it isn’t true, just that there’s no data in the research. The research didn’t explicitly discuss the value of exact match domains. It wasn’t a comparison of Insurance.com to MyBestInsurer.com, for example — two brands you’ve never heard of, but one an EMD. Instead, the researchers compared brand value (in the form on a domain name) to non-brand domain names to see if there was bias. And there was. For example, would users trust medical information more from WebMD.com or GeneticHealth.com? Would users trust historical information more from Wikipedia.com than other sites? Other brands listed in Table 1 and Figure 1 were YouTube.com, Groups.Google.com, Yahoo.com, IMDB.com and Facebook.com. There was no mention of exact match domain names in the research, so I emailed all four researchers with my query. I have not received a response back yet. If I do, I will update the article accordingly. Great post, Michael. Keep up the awesome work! Definitely Can Tell You Are An Expert in Our Field. You bet. Thanks for commenting, Brian. One of the best articles I’ve ever read in this space. I know it was very time consuming to put together and fact check. Bravo. Awesome job, Michael. I’ve bookmarked this one, and will share it. Fantastic resource. Will definitely refer to this one as I’m brokering names in the future and refer potential buyers here! A comprehensive and thorough article on exact match domains.